Good Maen, all! Preparing to eat and drink too much today. 1:47. Happy Thanksgiving, Wolf, all our American friends and everyone with something or someone to be thankful for! Good Maen, good people. What a happy day when an entire nation stops in the name of Thanksgiving to focus on family and friend time. I hope the hearts of many return thanks to God today that we may indeed become again One Nation under God's provision, protection, guidance and spirit of brotherly love. While you are digesting, solve today's Easy by looking up the numerical equivalent of the word THANKS on your phone (842657) then solve the puzzle in that order filling in the last numbers going up. It works out very well. all. We are at our daughter's home in Lexington SC for Thanksgiving Day festivities. Everybody!! Overslept today. The rain was so soothing plus it got rid of the smoke! Was able to open bedroom window for first time in two weeks. Plus, no smoke makes Thanksgiving extra special. 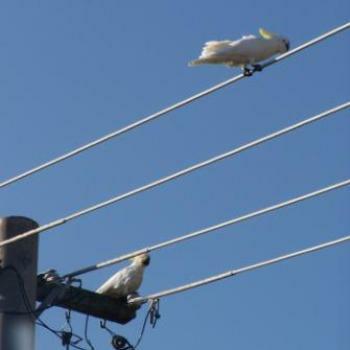 Morning all, those cockies would have a hard time staying on the wires in the strong wind we have here since yesterday. The wind also brought down a tree across power lines that started a fire not far from us , with the windy conditions it was quickly out of control. It has burnt through to Salt Ash with no houses lost. Still a bit of smoke around this morning but the fire is under control. Windy down here but that's not unusual. Not as strong as predicted though. Quiet today, all the Northerners too stuffed with turkey to get to their computers. Lovely blue sky for the cockies to roost beneath! Amelia, we had strong winds combined with storms yesterday - just the day we had to travel right across town to a funeral. Because of Col's injury he couldn't drive, so there I was in 80kmph winds, driving rain, thunder and lightning with semitrailers on either side of me on the M1 up near North Lakes. Scary!! Happy Thanksgiving. Greg used to send Jacquie Lawson cards several times each year, Thanksgiving being one of them. I'm missing getting his card. Slow day. I was off to see a movie and back. Was sure I would have missed my chance. But no, it is still waiting for me. ... & a CP+1 to boot. Denny, what a wonderful list of things to be thankful for! Amelia and CynB, glad to hear of everyone's safety despite bad conditions. Keith, thank you for the remembrance. I have no idea why the word indoor appeared in that last comment. I am up in the middle of the night because I crave coffee with Thanksgiving dessert and no one else wanted to share a pot of decaf with me so I drank regular. Just one cup, but too late in the day. Now would be a great time to catch up on Wombat's poozle that I missed but that would involve turning on a light and I don't want to risk waking anyone else! Hello, Rage! I'll yield the floor to you. I am going to try to head back to bed. I hope that Plum can get back to sleep. Perhaps an alcoholic drink would help you sleep Plum. A nightcap is a common solution. Skol. I won't need anything to make me go to sleep, but seeing we have reached beer o'clock I wouldn't mind a Guiness. It is highly unlikely that anyone will read these posts as so few people look back at the previous day. It would be nice if more people did. I'll have one too, Wombat. Well that's a CP, and along with my comment above I feel quite confident in claiming Last Post of the Day. Sorry, Wombat, but I didn't go to sleep (yet?) and there are still three hours until calendar turn. I've gotten hungry since I didn't eat supper after an early afternoon feast (plus I had skipped breakfast). My hunger is keeping me from falling fast asleep but my warm nest of blankets is keeping me from raiding the fridge. Okay, I'm going to try to close my eyes again. Well, if the previous LPOTD didn't work, perhaps this one will.